NASA's Near-Earth Asteroid Scout, a smallsat designed to study asteroids close to Earth, performed a successful deployment test on June 28 of the solar sail that will launch on Exploration Mission-1 (EM-1) — the test was performed in an indoor clean room at the NeXolve facility in Huntsville, Alabama. The NEA Scout solar sail is deployed at the NeXolve facility in Huntsville, Alabama. Photo is courtesy of NASA/Emmett Given. NEA Scout is a six-unit cubesat that relies on an innovative solar sail for propulsion. It is one of 13 secondary science payloads NASA selected to fly on EM-1. The first in a series of increasingly complex missions, EM-1 will be the first integrated test of NASA’s Space Launch System rocket, NASA’s Orion spacecraft and the newly upgraded Exploration Ground Systems at Kennedy Space Center in Florida. In addition to testing these integrated systems, this first flight will also provide the rare opportunity for these small experiments to reach deep space destinations, conducting science missions and testing key technologies beyond LEO. NEA Scout will deploy from the rocket after the Orion spacecraft is separated from the upper stage. When deployed, the sail, which is square in shape, with each side about the length of a school bus, will harness the light of the sun to use as propulsion to move through space. Instead of wind, solar sails reflect sunlight for thrust, minimizing the need for fuel. This method reduces the size and weight of the spacecraft, thereby resulting in cost savings. The NEA Scout solar sail will deploy from the spacecraft using four arms — called booms — to hold the sail, much like a sail on a ship. After deployment, the satellite will travel to and fly-by an asteroid, taking photographic data that will help scientists better understand not only the asteroid itself, but the risks and challenges that future human exploration missions may encounter. Solar sails can’t run out of fuel as long as the sun shines, allowing them to propel spacecraft farther and faster than some traditional propulsion technologies. 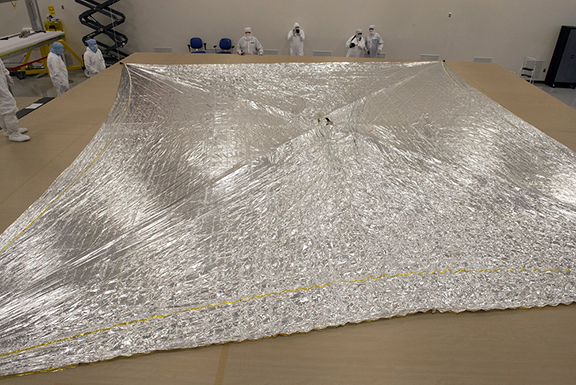 Spacecraft like NEA Scout are the next step towards larger and more capable solar sails that can take our science instruments farther into the solar system, enabling new science and exploration missions. 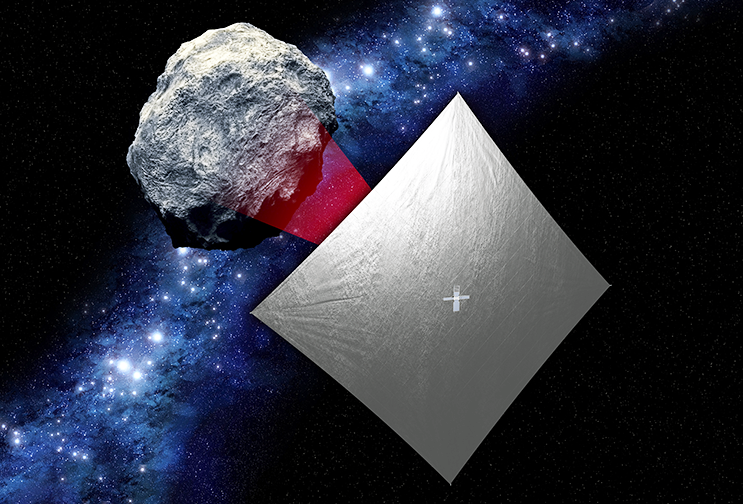 Artistic rendition of the NEA Scout CubeSat with its solar sail deployed as it characterizes a near-Earth asteroid. Image is courtesy of NASA. NASA’s Advanced Exploration Systems manages NEA Scout with the team led at Marshall with support from NASA's Jet Propulsion Laboratory in Pasadena, California and NASA's Langley Research Center in Hampton, Virginia. AES infuses new technologies developed by NASA's Space Technology Mission Directorate and partners with the Science Mission Directorate to address the unknowns and mitigate risks for crews and systems during future human exploration missions. Joe Matus, NEA Scout project manager at NASA’s Marshall Space Flight Center in Huntsville, Alabama, reported that developing a sail to harness the sun’s energy to fly through space was once thought impossible. Just in this decade, innovation and progress as been seen on this promising technology and NEA Scout is another step to using solar sails to explore the solar system. This team has worked really hard to make this technology a reality, and knowing that the sail that was just tested will be the actual sail that propels NEA Scout through space is exciting, and a testament to the knowledge and capabilities of the team. Tiffany Lockett, NEA Scout project system engineer at Marshall, added that over the last couple of tests, improvements were completed to the spacecraft’s sail deployment system. This test is the first and only time the sail will be deployed before it flies on EM-1, so the team had to make sure the system will work correctly. The test data is being analyzed to make certain the deployment system worked as expected, before final assembly into the spacecraft and delivery for launch.